Since Jan 2018, broader markets are in bear phase. Over last few weeks, we have seen small & mid cap stocks getting butchered with fall in stock prices on almost daily basis. At current scenario, when Small & Mid Cap Index is down by 33.9% and 23.4% respectively from their peak made in January last year and significantly underperformed Sensex & Nifty, no body want to touch this space. Most of the liquidity in small & mid caps has dried up and found its way to large caps over last 13 months. At this juncture, large caps looks fairly valued or expensive in terms of valuations, however small & mid cap companies look attractive and can reward long term investors in big way. In fact, some of the worst times to get into the market turned out to be the best times for long term investors and same seems to be applicable now for small & mid caps. We believe this is a blessing in disguise because for the first time in many years, several small companies having robust business fundamentals are available at attractive valuations. Do you know in last 16 years, small cap index have not given negative returns for 2 consecutive years. In 2018, BSE Small Cap Index has given negative returns of -23.4% and since beginning of this year, index is down by another -9.7%. 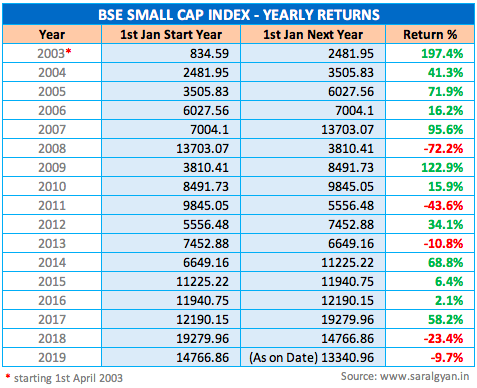 Below is the table which indicates Small Cap Index returns YoY since 1st April 2003 (the data is available from April 2003 onwards only in BSE). Whenever, Small Cap Index delivered significantly high negative returns in a particular year during last 16 years, it has delivered double digit positive returns the very next year. While Nifty and Sensex which are hovering near their life time high and are down by roughly 7% from their peak, Small & Mid Cap Index have underperformed by wide margin and is down by 34% and 23% respectively from their peak made in Jan 2018. The divergence between Sensex / Nifty and Small & Mid Cap Index will not last for long going forward considering valuations gap emerging between large caps in comparison to mid & small cap stocks. If you analyse the bear phase of stock markets cycle since 1990, you will find that such bear phase has not lasted for more than 15 months. Small cap index which made high in Jan 2018 with end of its bull run has already corrected by -33.9% from its peak of 20,184 in last 13 months. Taking clues from history, we believe we are close to end of bear cycle in broader market after which stock prices of small and mid-caps will start recovering by going up and further up. Below is the monthly chart of BSE Small Cap Index since 2005. The chart illustrate that the last decade bull run which started in 2003 made a peak in Jan 2008 and later went into bear phase with continuous fall in stock prices of small caps for next 15 months, i.e. from Jan 2008 to March 2009 and later stock prices of small caps recovered and went through correction and consolidation phase. Similarly, bull run in small caps which started in 2014 made its peak in Jan 2018 and moved into bear territory later. This month i.e. Feb’19 is the 14th month of bear phase experienced by broader markets – small & mid caps. If history of small cap index repeats itself (have very high probability), we are near to end of bear phase after which stock prices of small caps will start moving northward. With fear of losing capital and dampened sentiments towards broader markets, small cap stocks are falling like nine pins these days. We have observed a lot of hopelessness towards broader market as Investors who started investing in equities during 2017 and 2018 are not willing to invest in this space due to pain of high negative returns in their portfolio and negative sentiments towards broader markets. Series of negative developments have made Investors taking back seat in terms of investing in broader markets. Earlier, Yes Bank and DHFL were dumped by Investors due to RBI measures and liquidity concerns, followed by severe correction in Essel group stocks like Zee, Dish TV etc due to high debt concerns and recently ADAG group stocks spoiled market sentiments. Recent episode of Reliance Communication opting for insolvency with NCLT has collapsed the ADAG group companies stock prices as lenders started selling collateral shares of these companies. Collapse in stock prices of such well known and bigger companies butchered investors faith and interest towards investing in small and mid cap companies. Usually bottom is made during these panic times which we are witnessing currently with series of negative news flow. Once broader market start factoring all these negatives along with uncertainty of upcoming election, the focus will shift towards individual company's earnings growth and current valuations which will drive stock prices up in coming quarters. Greed which was seen in broader market (small & mid caps) in the year 2016 and 2017 has turned to fear these days. During last few weeks, we have received many mails from our members seeking advise in terms of which Hidden Gems / Value Picks stocks they continue to hold and which ones to exit. Are you also fearful? This is the time to do opposite of the herd, its time to be greedy when others are fearful. If you are not investing in equities during these opportune times and taking the back seat, you are making a bigger mistake. Are you not following the herd mentality? If you have invested in markets during 2016 and 2017 when valuations of companies were significantly higher compared to today’s valuation, why you have stopped investing now? Remember, in the long run, you do not make decent returns on your investments by following the herd i.e. when everyone is buying stocks; instead you get handsome returns on our investments by investing in stocks at significantly low prices as no one else is buying, and by selling to them when they come back in herd due to greed in future. You might be thinking, when stock prices are falling almost on daily basis, why to invest to risk your investments. Agree! If you are not a long-term investor and thinking to make quick bucks by timing the market, it could be risky. Hence, we advise to invest only keeping a longer time horizon, minimum 2 to 5years or more. In fact, to make enormous wealth from equities, you should have horizon of 10 to 20 years so that you can experience 2 to 3 market cycles and reap maximum reward during bull phase of equity markets. We do not believe in timing the market and hence advise our members to follow a discipline approach, but it’s wise to turn aggressive in terms of equity investing during panic times which we are experiencing now. We believe above article has helped you giving complete insight of equity market cycles specifically small caps during bull and bear phase and benefit of investing in them during extreme pessimism / painful periods with long term horizon. Also make you understand, why its more important to be a disciplined investor who keep on investing in systematic way irrespective of market conditions and not an emotional investor who usually buy stocks during bull phase when stock prices are moving higher because of greed and sell them in panic during bear phase due to severe fall in stock prices, making mistake of buying high and selling low. We are pleased to inform you that we decided to pass on the maximum benefits to our members during such opportune time of Investing. Do continue your Investing journey in a disciplined way for long term instead of stopping just because to severe fall in stock prices. You can avail our subscription services at best discounted prices which is applicable only during offers period. Click on SUBSCRIBE! link to subscribe to our services online using debit / credit card or net banking facility. Please note that above discounted prices on our services are applicable only for limited period after which these discounts will not be applicable. In case if you are not comfortable in subscribing online, you can make the payment through cheque deposit / NEFT transfer in any of our bank and writing back to us sharing transaction details. Click here to know about our other payment option and bank details. Do write back to us in case of any queries.